This Legal English collection is based on the English Common Law MOOC lectures (University of London with Coursera). It enables both native speakers of English and non-native speakers of English to go deeper into the lecture material with content mining technologies, highlighting key terms and concepts from the English common law through interactive learning designs. Please take a look at our 3 quick training videos below to guide you around the English Common Law MOOC Collection in FLAX. We also have a short for collecting user feedback on the FLAX English Common Law MOOC collection to help us improve our learning and software designs. We are offering a prize of a $100 Amazon gift voucher for participating in the survey. Be in to win! Thank you. This collaboration for the development of these socio-legal English language resources is between FLAX and Alannah Fitzgerald with the Open Educational Resources Research Hub, and with funding from The International Research Foundation (TIRF) for English language education. 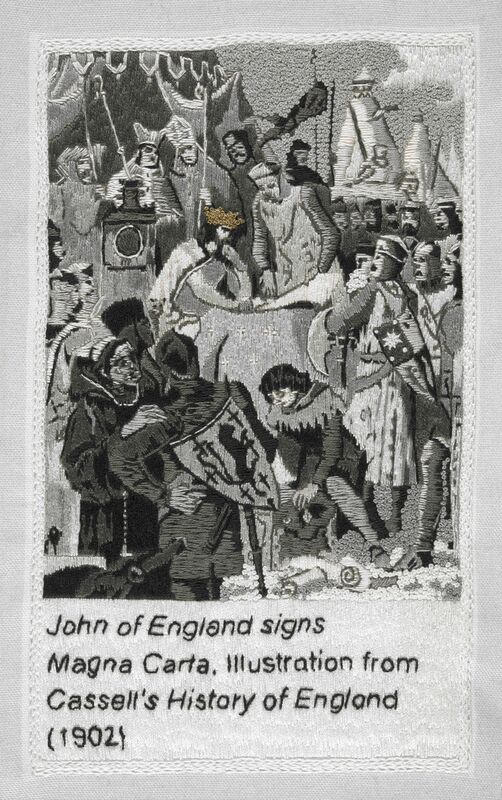 Image: Detail from Magna Carta (An Embroidery) at the British Library, showing King John signing Magna Carta, as depicted in a 1902 illustration reproduced in the Wikipedia article Magna Carta on 15 June 2014. Stitched by Janet Payne and conceived by Cornelia Parker. Licensed under the Creative CommonsAttribution-Share Alike 3.0 Unported license.